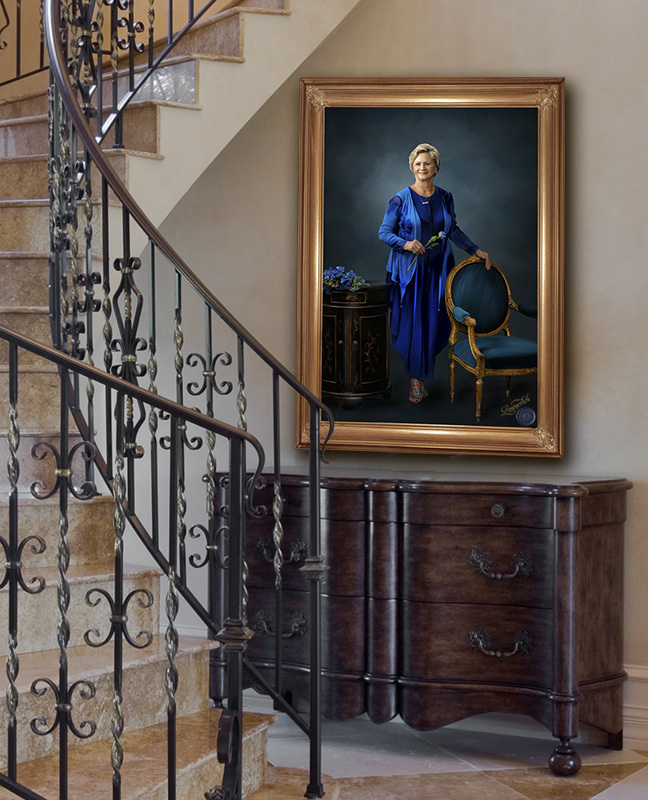 Your personalized portrait is an art piece that will be cherished for many generations, a portrait that is on loan from your children until one day they will proudly display it in their home. European classic portraitists to create art that reminds them of what is most important in life - their own family. These portraits were painted in Grand Style, subtlety textured, life sized, framed in sumptuous gold-leaf or hand carved wood frames and proudly displayed in homes of royals, aristocrats and socialites. Today, Siena Artè continues in the grand style tradition of those old world master painters. 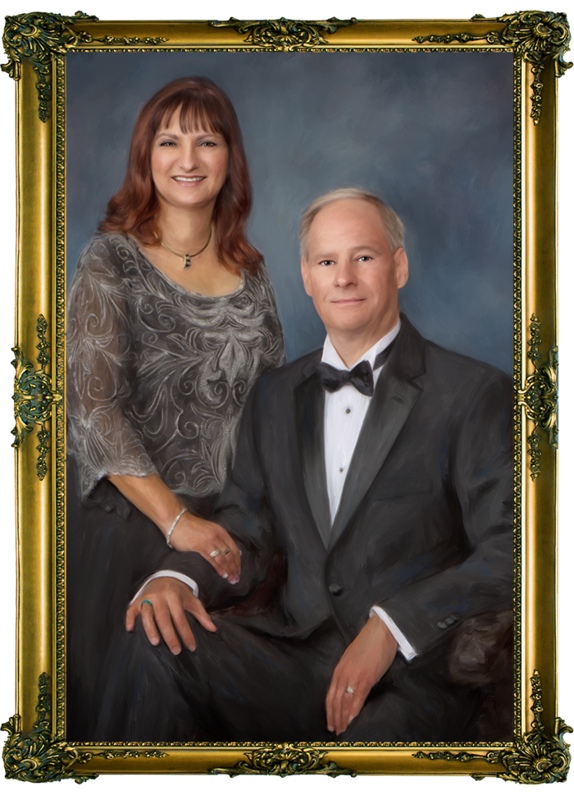 Elegantly posed, beautifully lighted, finely finished portraits in the highest standards of consistency and quality - an eloquent reminder of whom it portrays and the importance of family relationships. Siena Artè Portraits are classic and timeless, an heirloom to share with your family and friends and pass down to future generations. Your personalized portrait is an art piece that will be cherished even more as time goes by. Families can spend thousands of dollars on beautiful oil paintings, but displaying a wall portrait of your family is priceless and adds personality and warmth to any décor. What Can I Expect During My Portrait Session? You can expect to have fun! We enjoy taking our time to get to know you and helping you select the best clothing and color choices from what you have brought. Snacks and beverages are always available and you will have time to relax between set changes. Your session will last approximately one to two hours, but may take longer. There are no limits on clothing or background changes. Our clients appreciate that they are never rushed, as we understand the importance of taking breaks especially with maternity and infants. Our goal is for our clients to have a fun, relaxed experience. We want you and your family to be happy with your experience and we offer a 100% satisfaction guarantee. Once you are finished with your session, we will schedule a mutually convenient time with you to view and order your portraits. Our presentation session is very laid back, takes place in our comfortable presentation room and is designed to give you plenty of time to select your favorite portraits and decide what type of products you wish to invest in. Expect to spend approximately an hour with us. We will guide you through the portrait selection process and advise on the proper size and finishes for display in your home, Please have anyone involved in making your portrait decisions present during this preview as this is the time your orders are placed. ‘The studio is beautiful and Connie & Bob's expertise is unmatched. Our story begins in elementary school, where music brought us together as friends in the school band. Connie started out as a musician and dancer in school and then continued studying and teaching dance for over 25 years. Bob was also a musician in school and began his interest in photography when he was 17. Together, we compliment each others creative and technical skills to produce portraits that tell a story and which our clients will be able to cherish through their lifetime. We love the ability to invoke emotion through portraiture, and there are few professions that can provide the satisfaction when we see our clients faces as they relive the moments that we have captured for them forever, Our Masters Touch formal portraits are highly sought after by families that desire a timeless classical portrait that will remain in their family for generations to come. We are both active members of the Professional Photographers Association of America (PPA) and serve as Directors on the Board of the Arizona Professional Photographers Association (AzPPA) where Bob and Connie are Past Presidents of AzPPA. Connie and Bob both hold the Master Of Photography degree and Photographic Craftsman degree from PPA and is honored to be selected as members of the distinguished American Society of Photographers. Our Master of Photography and CPP designations, achieved by less than 1% of professional photographers worldwide, ensures that our skills and artistry remain at the highest professional levels. Siena Artè is the only portrait studio in Arizona owned by a couple that are both Master Photographers. - For meritorious contributions and service to the professional photographic industry, Connie was awarded the PPA National Award in 2018 and Bob was awarded the PPA National Award in 2019 - the highest honor PPA bestows upon a member within Arizona.